I've made a start putting shelving into the steering room. There is not a single thing straight in the place, making judging the heights of the shelves a tougher job than you'd think. The floor slopes down away from the stern, so the post heights are all different. The stern is curved in an uneven arc, especially in the area where there is a bit of a dent, making cutting the outer edge neatly practically impossible. Looking at the picture, you'd think that top self is never going to be even close to level. It will be fine, I can assure you. It's deeply satisfying work seeing all this come together, plus I finally get some badly needed storage space in the steering room. My fleet has now expanded to a total of five boats - considering that I had none just over two years ago, and didn't really mean to own any boats at all, that's not bad going. This one simply drifted into my life. I found it nestled up between Lady Jane and the quay. If I had not rescued it, I suspect Lady Jane would simply have crushed it. I know where it came from, and offered it back. The former owners said "nah, keep it - it's no good anyway". With some tender loving care, it could be useful. Certainly more useful than the two person kayak I've had kicking around on deck for the last two years. Malcolm is very taken with the idea of tidying it up, so now I have a boat restoration project inside my boat restoration project. 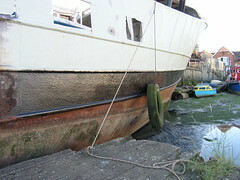 The picture you see is of Lady Jane's dark underbelly, right at the stern. 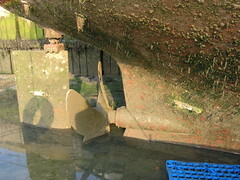 The grey lumps in the picture are the sacrificial anodes, which are bolted onto the hull. The idea is that the rust attacks the anodes, which are of a softer metal than steel, so they corrode away before the steel that is the hull. 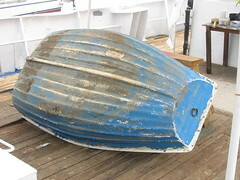 Once the anodes themselves are gone, the hull itself starts to disappear. I have a few anodes which have completely disappeared, so they need replacing pretty quickly to prevent poor old Lady Jane from wasting away completely. The painting on Lady Jane is seemingly a never ending task. 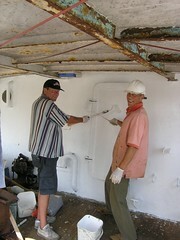 Here Malcolm and Fred are making free with my supply of best white paint. 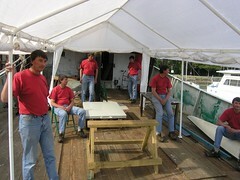 Lifelong pals, they chat and joke while getting on with painting Lady Jane. All this painting activity marks the transition of Lady Jane from a big rusty old thing into a boat I can live on, and enjoy. I've finally managed to get a coat of blue on the hull. The result has certainly exceeded my expectations. There is still more rust busting/priming at the waterline to do before the whole thing is blue, but it's very satisfying to have done as much as we have. It seems so long ago that I made the decision to paint the hull blue, and actually bought the paint. I've discovered that, with organisation, it's entirely practical for two people to paint the entire starboard side in a frenzy of painting lasting three or four hours. It helps if it doesn't rain halfway through painting though. 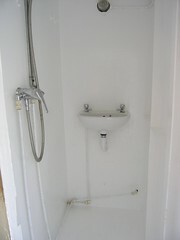 The shower room is now very, very, nearly complete. Here you see the shower room in all it's glory, with it's final coat of finishing paint and the wash basin and shower unit finally plumbed in. I have a cabinet with a nice big mirror to go in which, along with a shelf I've had for a while, will make the room complete. The observant amongst you will see that there is only one pipe plumbed into the basin, that's on account of the fact that I ran out of speedfit pipe, and also did not have another tee piece or a drain pipe. The choice was to plumb in the cold water either to the basin or the toilet. Of course a flushing toilet got priority. The cold water supply to the basin and drain pipe will probably take about 15 minutes to fit (I hope). Finally, the duckboards from before have been cleaned up and repaired. They will probably last forever, even though I could do with making up some better fitting ones sometime. It's summer so, quite naturally, it's barbeque season. All sorts of things came together perfectly, ensuring a wonderful barbeque (braai) for all of us. I'm reminded that this lifestyle is what it's all about. 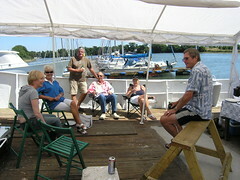 No amount of money in the world could top the enjoyment of being with good friends in such an idyllic setting. Thanks to one and all for being there. 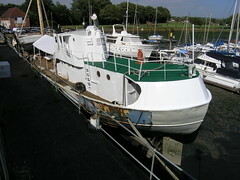 I've managed to get a couple of coats of white paint on the upper section of the stern. I must say, I'm very pleased with the result. Lady Jane is starting to look more and more like a 'proper' boat. I find myself thinking why didn't I just paint her when I first bought her? The reality is that just slapping paint on is easy, anybody can do that. Getting the paint on in the knowledge the paint job will stand the test of time, and rust, is another matter. The hard bit, as you know from this blog, has been all the infrastructure setup, the preparation and, probably most important of all, the learning. Worth it so far? I think so. This lot is right down by the waterline, so is hard to get to unless the tide is out. Previously, when I first started rust busting on the hull, the platform you see in the picture would slide away from the boat in the mud, making it impossible to reach the side. That's why this section has not been touched before now. I had also secretly been hoping to avoid doing this tricky section, hoping Lady Jane would look ok. The reality is, with all the rest of the starboard side primed (except for a bit at the bow) this bit simply looks awful in comparison, and has to be done right down to the waterline. On the plus side, I've had an increasing number of strangers comment on how good Lady Jane looks. It's always gratifying to have the results of so much effort noticed. Sometimes some of the things that happen seem so unreal that they simply could not be made up. For years I've had a lasso, given to me by some friends in the US. When I was first given the rope a friend of mine and I spent quite some time trying to lasso things and, even more amusingly, trying to twirl it above our heads. Needless to say our efforts were completely fruitless, and the rope was consigned to the attic. Not long ago, while looking for something else, I found the rope in the attic and remembered that Archie, from the Donald Redford, had spent a large part of his life working as a cowboy in Wyoming and Montana. Not expecting too much, I showed the rope to Archie, explaining the difficulty I had with it. Archie immediately grabbed the rope, headed for the quayside and proceeded to spin it expertly, then set about roping everything in sight, including me. 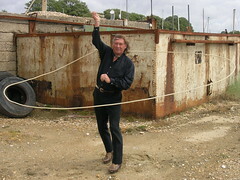 It just seems so amazing to me that the skipper of the Donald Redford, in Fareham - England, proved so adept with a rope that nobody I know in the US could twirl! I'm still grinning at the memory of it now. I've finally got a first coat of Hempel white finishing paint on the starboard side. I know from elsewhere on Lady Jane that after a second coat, the surfaces will shine so much that visitors will need to wear sunglasses. The very white paint in the afternoon was in stark contrast to the very black bitumen paint I was applying in the stern accommodation in the morning. This is not the first time I've painted the starboard side white, though last time I had no idea that the paint I was using was not fit for the purpose. 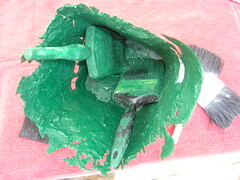 That coupled with no proper primer ensured rust would show through in no time at all. I also know that there are a few spots where some of the old primer I was using has cracked, and will need re-doing at some point. For now, though, I'm just happy to have Lady Jane looking good. Here's what happens when you are in too much of a rush to get down to the pub after painting, and forget to clean up the brushes. Those brushes are now rock solid. There is no way they will ever be any use, except as a piece of artwork in their own right. The brushes generally don't last that long, what with the amount they get used and the type of paint I'm using, so it's no great loss. Good thing I order them by the dozen. Some days I feel there is just not enough of me to go around, as there is such a variety of jobs to do on Lady Jane. Engineering - engine maintenance etc. There would also have to be an image of me taking a big fat tea break, and enjoying life on board, in there somewhere. When I'm less busy with stuff I may give it another go. Pity I can't be Photoshopped for real. 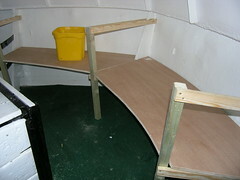 I'm continuing to make good progress with the stern accomodation space. 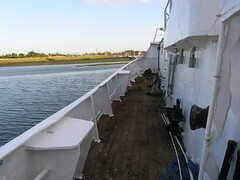 The steel below where the deck was has all been cleaned up, and a coat of rustroy applied. It stinks of chemicals down there at the moment, making it uncomfortable to even be in the galley. It won't be long before I get a coat of bitumen paint over the whole lot. Once that's dry the smell will be gone.